As I stroll through the streets of Madrid on my way to The Prado, I read quotations from beloved Spanish authors inscribed in golden letters on the sidewalk beneath my feet. This is how Madrid expresses her love of arts and letters in one particular neighborhood, Huertas, also known as “barrio de las letras.” This love is also evident in the treasure trove of Old Masters paintings in the Prado, the classical sculptures scattered throughout Retiro Park, and the reverent hush in the air around Picasso’s “Guernica” in the Reina Sofia museum. A monument to Miguel Cervantes, complete with bronze sculptures of Don Quixote and Sancho Panza, stands at the center of downtown’s Plaza de España. Madrid also prides herself on being open-minded. Her population (3.3 million in the city proper and 6.5 million in the metropolitan area) welcomes immigrants from Latin America, Eastern Europe, North Africa, West Africa, China, and Japan. She’s proudly out in the thriving gay neighborhood of Chueca and boasts possibly the biggest Gay Pride parade in Europe. After more than 40 years of Fascist repression, she is eagerly embracing yoga, Pilates, ecstatic dance, and other new modalities. This sophisticated European capital offers first-world infrastructure, thriving creative life, and sunshine at a modest price. 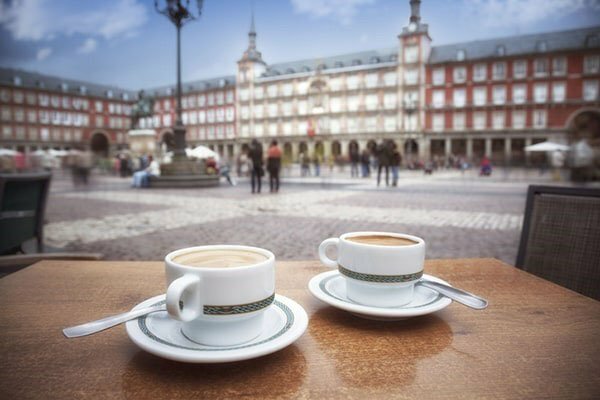 Located in the center of the Iberian Peninsula, at an altitude of 2,000 feet, Madrid’s climate is warm and dry. In fact, it’s the driest capital in Europe with most of its average annual 16.6 inches of rain falling in spring and autumn. Winters are mild with low temperatures in the 30s F, but summers can be scorching. Many Madrileños escape to the beach for the entire month of August. Except for a few wily pickpockets, crime is negligible. It is safe to walk the streets at any hour of the day or night, and sidewalks in the lively districts of La Latina, Lavapies, and Malasaña are crowded well into the wee hours. Madrid’s public transportation is so efficient and inexpensive that owning a car is unnecessary. Tap water is not only drinkable, it’s delicious. Madrileños love to socialize. Sidewalk cafes, terrazas, and parks are always crowded and convivial. Meeting friends in bars and coffee shops for conversation and camaraderie is a sacrosanct ritual that is not impacted by any financial crisis. During the hot summer months, Madrileños live at night. Streets are quiet during the day, but cafes fill to overflowing after sundown. Free concerts start at 10 pm. If you are an “early to bed, early to rise” person, Madrid is probably not for you. Stores open at 10 a.m. Lunch is at 2 p.m. Dinner is at 9 p.m., 10 p.m., or even 11 p.m., and then you may go dancing. The last metro is at 1:30 a.m., and it is always packed. If you miss it you can take a taxi or just stay up until it opens again at 6 am. Madrid definitely knows how to party. 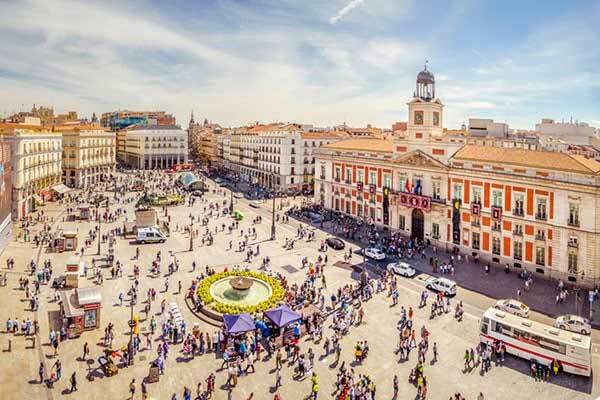 Although over six million tourists a year visit Madrid (only 20% of Barcelona’s 32 million), these sightseers, and the businesses that service them, tend to cluster in the central areas around Puerta del Sol, Plaza Mayor, Atocha, Huertas, and Paseo del Prado. Many residential neighborhoods tend to be relatively tourist-free. As a single woman, one of my concerns about retiring in a foreign country was my need to build a network of new friends. The friendliness, welcoming warmth, and helpfulness of the local people made Madrid my first choice. If you want to include other expats among your friends, that’s easy too. Thousands of expats from all over the world live in Madrid. The Expats in Madrid Facebook page has over 15,000 members and offers a handy resource for advice and invitations. The American Club of Madrid hosts events and encourages networking. Most expats are from UK or other European countries, so North Americans have the advantage of being a bit exotic. You can easily get away without speaking Spanish if you want to. Spaniards 30 and under studied English in school and speak it very well. Spaniards over 30 are in the process of learning and are eager to practice. If you do want to learn to speak Spanish, opportunities abound with classes, language exchange intercambios and daily life. Healthcare in Spain is excellent, which may be why life expectancy here is one of the longest in the world. Hospitals and clinics are everywhere in Madrid. You are never more than 15 minutes away from a doctor. If you are working or from an EU country, you can take advantage of the high-quality public system, but retired North Americans are required to buy private health insurance during their first five years of residency. The largest private insurance provider is Sanitas, which offers services much like an HMO in the USA. At age 72, I’m in the highest cost bracket. My monthly premium is about what I would pay for Medicare, a Medigap policy, and Plan D prescription coverage in the U.S.
Madrid is a major transportation hub, for the rest of Spain, for Europe, for the world. The primary international airport in Spain, Adolfo Suárez Madrid-Barajas airport, is 12 kilometers from Madrid’s city center. Madrid’s metro delivers passengers right into the terminal. Spain’s efficient trains can be accessed from two main stations, Atocha and Chamartin. Long distance buses leave from Estacion del Sur, Avenida del America, Principe Pio, and Moncloa. Real estate bargains are rare in Madrid. As in many major metropolises worldwide, rents and prices are rising fast. Both rentals and properties for sale run the gamut from super-luxurious to humble. Prices depend on location, size, condition, whether the unit faces a sunny street or a shady interior courtyard and amenities such as elevators, air conditioning, and appliances. Furnished rentals are readily available. Single family homes and mansions can be found in exclusive suburbs such as Pozuelo and Moraleja. Idealista.com is a popular website for finding rentals and properties for sale throughout Spain. It allows you to search by neighborhood, price, and amenities. If you are willing to rent without viewing the property in person, take a look at spotahome.com for fully online rentals. For flat-sharing options, try badi.com. For those with the means to buy a property for cash, doing so can facilitate the residency visa process. The coveted “golden visa” that permits residency, work, and investment is granted with a real estate purchase of more than $562,600 (€500,000). Check with an immigration lawyer for details and conditions. Madrid’s diversity is reflected in her neighborhoods. Options range from upscale Salamanca (near Retiro Park) to working class Vallecas on the outskirts. 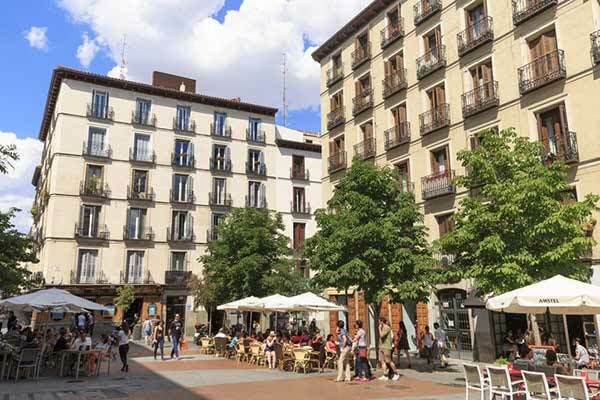 Popular residential areas near the center include trendy-alternative Malasaña, gentrified-gay Chueca, multi-cultural/hipster Lavapies, historic La Latina, elegant Huertas, and upper middle-class Chamberi. You can rent a studio in Vallecas for $565 a month or a three-bedroom flat in Salamanca for $3,375. You can buy an apartment in a working class neighborhood for $78,760. Rooms in shared flats rent from $200 to $800 a month. Purchases of single-family homes range from $560,000 to multiple millions of dollars. In upper-middle-class Chamberi, a neighborhood of families and retirees as well as students and faculty from the nearby university, studios rent for $700 to $2,250 a month and sell for $90,000 to $550,000. Two and three-bedroom flats with two or more bathrooms are listed from $280,000 to $2,000,000. Madrid may be a bit more expensive than other places in Spain, but she still offers a lot of bang for the buck. Wine and beer are about $2 per glass. A generous gin and tonic will be about $7 to $9. Three-course menu del dia lunches run from $8 to $16 including wine or beer. In Chamberi, a hearty menu is $10 to $14. Most restaurants also offer a single plate at around $8. Prescriptions and medications are a fraction of U.S. prices. For me, the greatest savings come from not needing to own a car. As a senior resident, I have unlimited access to the efficient metro and bus system for $13.80 per month. If I splurge for a taxi, it’s usually around $11.